Shipped with: Available as an upgrade for all Amiga models. New screen modes and improved support for graphics cards. New ANIM and CDXL datatypes. Significantly accelerated graphics rendering via rewritten graphics and layers libraries. CD-ROM support (including CDXL), reads standard ISO9660 CDs (including PC data and Kodak Photo CDs). Improved GUI with easier color selection and more flexible "pen sharing" color assignment. Bug fixes to Workbench 3.0. Minor ReTargetable Graphics (RTG) improvements. Support for the CD32's chunky-to-planar chip, Akiko. Font-sensitive "Execute Command" and "Rename" dialog boxes. Click here for an official list of changes in 3.1, and here for a text file review of 3.1. So what was Commodore planning to include in their 3.1 update that never made it? Ignacio Gully shares some info. 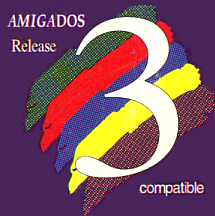 Fixed: The AmigaOS Workbench disk image was not bootable. exec.library 40.12: Updated the copyright information text. Fixed a small bug in the memory pools code which mirrors the same bug fix in the same code that was used in amiga.lib. strap 40.3: The Boingball logo replaces the rainbow-coloured checkmark logo. Slightly brighter background colour. workbench.library 40.6: Rebuilt with SAS/C 6.59 in order to free up more ROM space because the copyright text in the updated exec.library. No other functional changes. scsi.device 40.21 for A600: Small bug fix to the IDE task initialization, which now makes it possible to use it on the A600. Older Kickstart ROMs would use scsi.device version 39, because unlike version 40, it did not crash on the A600. scsi.device 40.21 for A1200: Same binary as used for the A600. Font-sensitive "Information..." and "Execute Command..." windows visible. Clue #1: Control is given to those who are shifted four from the start and do not give up on the alternate course. Clue #2: When it is about time to learn the secrets of the master, one must also qualify for the enlightenment. Joan Dow comments on 3.1 ROM development: "I'm trying to think back whether Commodore ever released 3.1 at all. I believe the release was interrupted by the bankruptcy. The development cycle never completed since each of the last three builds shown developers had problems on some system." Ross Vumbaca comments on the v40.60 ROM: "I saved this [his CD32's Kickstart 3.1] ROM to a file, and used it in an emulator ("soft-kicked"). It produces a normal "Disk insert screen" but for some reason, the palette screen would not appear in a CD32. The second 512KB of ROM (since it is a 1MB ROM) is supposedly stored at address: $E00000 - $E80000. The extra ROM contains CD32 specifics: boot-up screen, boot-up sound, CD player/locality code, debox.library, cd.device, and cdtv.device." The 3.1 ROM contains at least two improvements over the 3.0 ROM: minor bug fixes, and small RTG improvements. There were two releases of 3.1: VillageTronic obtained permission to release it to all their PicassoII owners back in 1994 (amidst some debate as to whether they really had this permission or not). Then, the official release occurred sometime after this. CD32          (40.56/40.58/40.60)  391640-02/ ? / ? These versions reflect slightly different scsi.devices in use for stability reasons as Olaf Barthel explains: "It's not the version number that counts. It's the type of machine the ROM was created for. The A4000T 3.1 ROM, version 40.70, does not contain any driver firmware to control the A3000 SCSI hardware. That's what you'll find only in the A3000 ROM. The last few OS revisions following 40.65 would contain only changes made to the SCSI (and the IDE) drivers. Somehow, some changes made it into the A3000 SCSI driver for 40.70 which for some people caused trouble with their SCSI devices. The driver in 40.68 did not trigger the same problems, which is why, eventually, 40.68 shipped instead of 40.70. Some of the 40.70 ROMs shipped to customers who didn't have any problems at all with the SCSI driver." Klaus Burkert provides further information in this regard: "There was 40.70 for A3000 and A4000 when VillageTronic initially released OS 3.1. But those versions had problems with some accelerator boards and with some hard drives, thus the step back to 40.68 was taken, the same reason is responsible for "only" 40.63 on the 16-bit systems. All this happened more than three years ago..." He goes on to add that: "They [the Kickstart versions] are not interchangeable—at least not with a fully working feature set. If you are ever told otherwise, the person/company either doesn't know or is lying." Markus Bieler notes another difference in v40.70: "The Kickstart for the A4000T does not contain the workbench.library. It was removed from the ROM to the Workbench disk (in the LIBS: directory), to make room for the A4091 SCSI support. So there is a small difference between the disks supplied with the A4000T and the disks for the other OS packages." M.C. Battilana notes that: "Not in our version, which includes workbench.library on both bootable disks (1/6 = Install disk, 2/6 = System). The A4000T ROM is not the only one to be without workbench.library, as our 3.X ROM also does not include it, for the same reasons (the space was needed for other improvements). Our Classic Support 3.1 Workbench disk set (and the Compact Flash version) works on all Amigas, including A4000Ts and those with 3.X ROM."